lately, whenever i'm in the kitchen, fixing ANYTHING, owen is right there next to me. he pulls up a chair from the dining room and climbs up to help. either he's washing dishes, well he's really pouring water all over the floor, or he is right there in the mix of all the cooking. 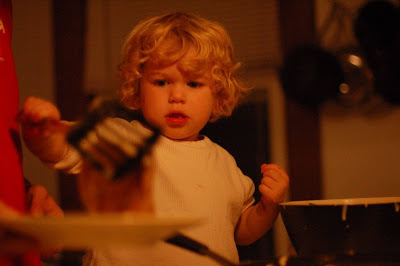 a few nights ago was pancake night, and he poured, mixed, flipped, and served mostly all by himself... with a little help after he burnt his knuckle slightly.